This dessert was also more private because it’s flavours that Alex tends not to enjoy as much. A just for me, moody cookie to eat while sulking on the couch watching countless episodes of Bones (is anyone else obsessed with this show?). Chocolate meets dark chocolate chunks meets dried cherries. This isn’t about eating your feelings. This is about taking a moment. Enjoying something just for you. 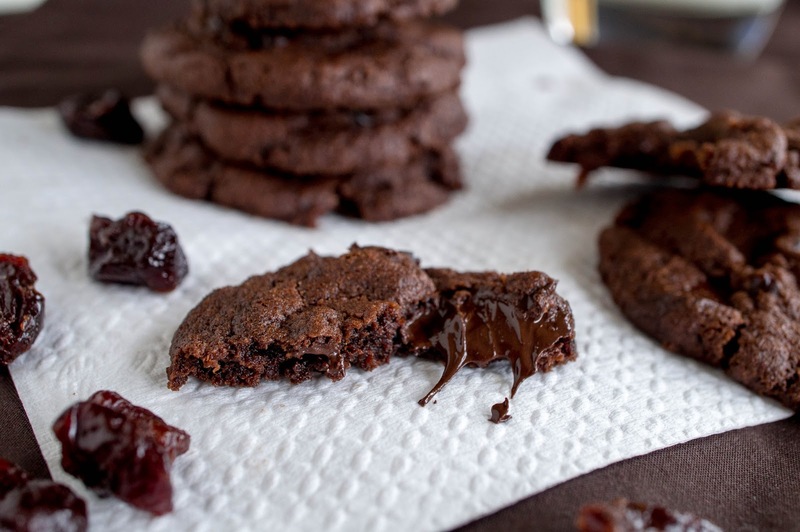 Savouring the chocolate melting on your tongue, and the little burst of sweet, fruity flavour from the cherries. This is about forgetting all the things you still have to do, and all the things that aren’t working, and just focusing on why Booth and Bones are not together yet (?!). 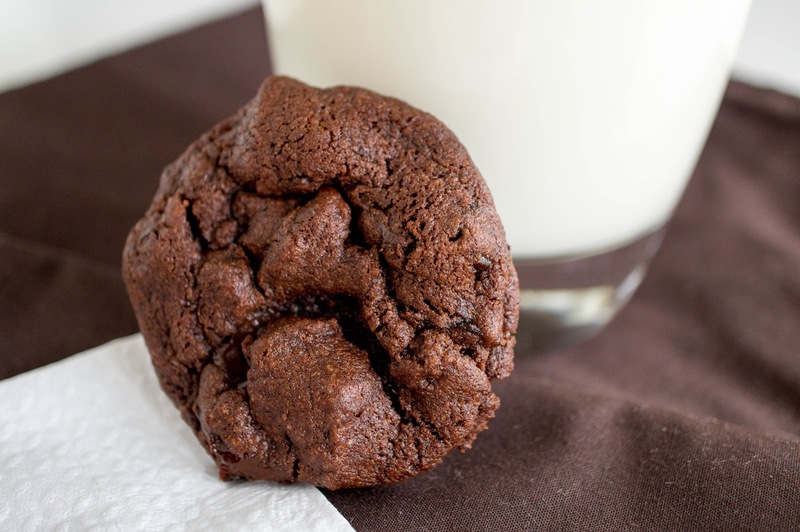 These cookies are also extremely fast and easy to make. One bowl, ten minutes to pull all the ingredients together and get these in the oven. This cookie’s personality suits me right now. Hopefully it’ll be all lemons and sunshine again soon. Preheat oven to 350F. 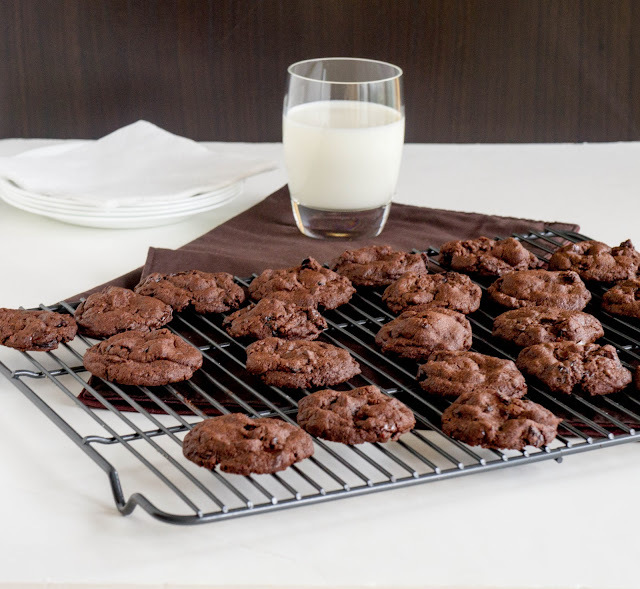 Line cookie sheets with parchment paper or non-stick mats. In the bowl of a stand mixer fitted with paddle attachment or in a large bowl (if using a hand-mixer) sift together flour, cocoa powder, sugar, baking soda, and salt. Add butter mix until combined. Add the milk and vanilla and mix on low speed until the dough comes together and starts to clump around the paddle or beaters. 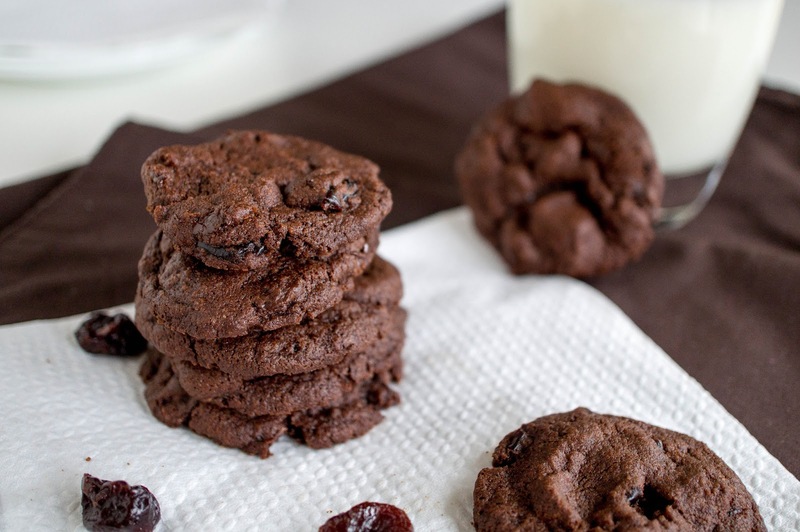 Mix or knead in the chocolate chunks and cherries. 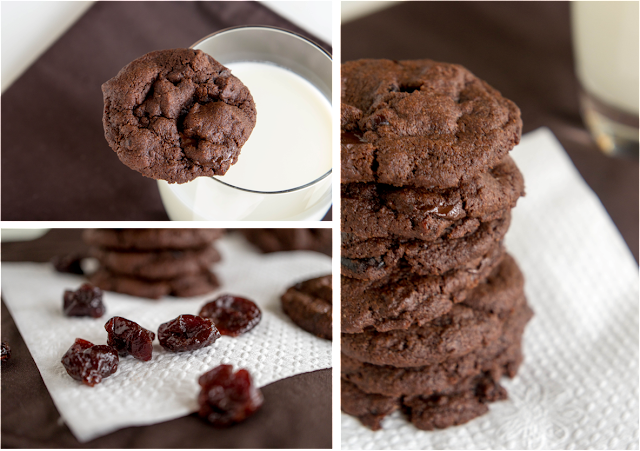 Drop dough by tablespoon onto prepared baking sheets leaving about 2 inches between cookies. Bake in the middle of the preheated oven for about 12 minutes or until the tops of the cookies look dry and the cookies are only a little soft when pressed with a finger. Slide the parchment onto a rack and let the cookies cool completely. Cookies can be stored in an airtight container for up to a week. Do you think these would work with fresh cherries? I'd be worried about the juiciness of the fresh cherries affecting the dough. Also, the flavour in fresh cherries is not as concentrated as in the dried ones so they wouldn't stand up as well to the chocolate. If anything I would chop them and try and dry them as much as possible by tossing them in some flour first. Let me know how it goes if you try it! New recipes would never be made if we didn't experiment! I have made these at least half a dozen times with fresh cherries and they turn out fantastic every time! I just take out the pits and throw the cherries straight in. I omit the milk because the cherries add that moisture and they bake just a little bit longer. Thank you for this recipe!